← What would you do with Cornercopia? Come join us on Sunday the 1st of June for our Big Lunch event. We’ll be serving up a charity lunch from a makeshift banquet table in the Brixton Village forecourt (Couldharbour Lane). With platters of delicious food made by various cafe’s and restaurants throughout the market – pick’n’mix style! £6 a plate with all proceeds going to a local charity. Serving from 1pm until the food runs out. But the fun doesn’t stop there, throughout Brixton Village and Market Row expect music, games, art workshops, raffles, lucky dips, a photo booth,competitions, silly races and silly faces! 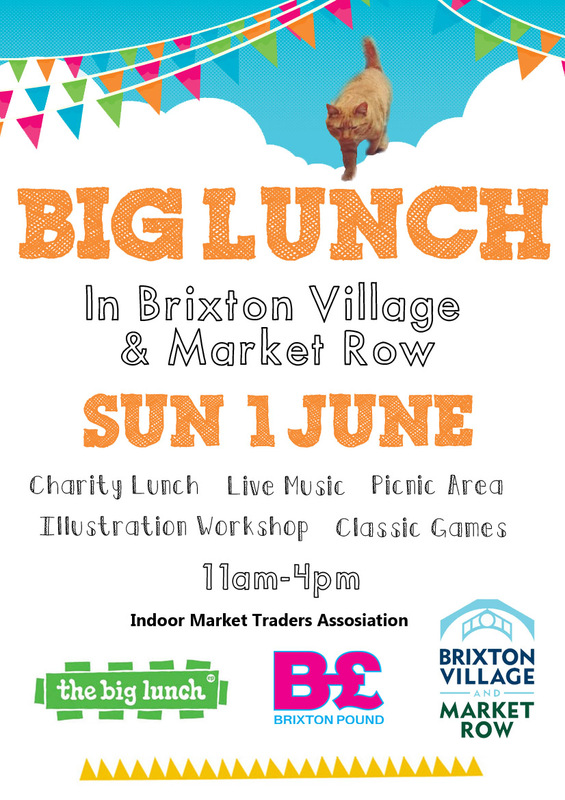 Volunteers needed for Big Lunch event in Brixton Market, Sunday 1st of June. Help create a mini fete in the Brixton Village forecourt – with all sorts of fun and games, music and mischief and a charity lunch! We need help between 10-5pm – even for just a few hrs. particularly setting up the banquet table, serving food and selling meal tickets. Get in touch with Rahima@brixtonpound.org for more info.